Anyone knows something about them? Little data about them online. I found realstreetperformance post on the subi forum saying they went 1000+ 11000 with them on a honda. The rod looks nice but BC parts are iffy some times thats why am asking. They also look identical to the CROWER steel billet i-beam.Probably the same rod? I know you were asking questions about this before, why not contact a reputable engine builder and explain to them what you are doing and what they suggest? I specifically use Locash Racing/TSR for my engine builds because not only do they do everything in house but have one of the fastest cars in the country. Oh and for my specific builds I ALWAYS overbuild just to be safe, I've done this too long to skimp on any parts because in the long run it is cheaper to spend a little extra in the beginning. I have to agree with my colleague here. That's something that a reputable builder could answer. (At least one that is reputable building these kinds of engines). Especially with the specifics of the +625 that you're asking about. I tend to overbuild as well, but not so much as the rod bolts, unless I'm doing a specific type of racing, in which that motorsport will determine the likelihood of whether or not I'll use those smaller upgrades. I agree with both you guys but because i also run a small business and i dont want to spend other buseness man's time without getting money from me since im located in Greece. I also like and will overbuild since i like to hit my staff hard but i dont overuse all the time like morrons. On the other hand i might want to hit the strip later thats why ill get at least simple H-beams with 625+. The arp2000 is comfortable with me on b16 on 9500 with average weight rods since its perfect on piston acceleration and rod stroke ratio. On the 1.54 r/s ratio much bigger torque much higher piston acceleration(and decceleration). Id never use the heavy rods (Ibeams etc) on 9000++ rpm with the arp2000 bolts on B20 setup. Its just me,.. fear of the poor geometry AND large forces. Id still use it on the very very nice weight carrillo pro-h beams each beam is like 50grams lighter from the i beams x-beam. Last edited by Balor_Gr; 03-21-2018 at 11:15 AM. I tend to overbuild as well, but not so much as the rod bolts, unless I'm doing a specific type of racing, in which that motorsport will determine the likelihood of whether or not I'll use those smaller upgrades. Everyone eventually either fails or learns this lesson. I definitely learned it the hard way a few years ago on my first major project. I guess, being conservative helps to keep that lesson at bay far longer than the risk takers, but I definitely see your point. What im trying to say is since there is no clear border at when you should upgrade the pins to 625, in my opinion say for the most times its earlier from the rods. I may be mistaken but i believe since we like to run our engines AT LEAST 9000, most h-beam failures are by the arp2000 saying "noooo" at the TDC on the exhaust stroke deceleration. But thats just a theory. 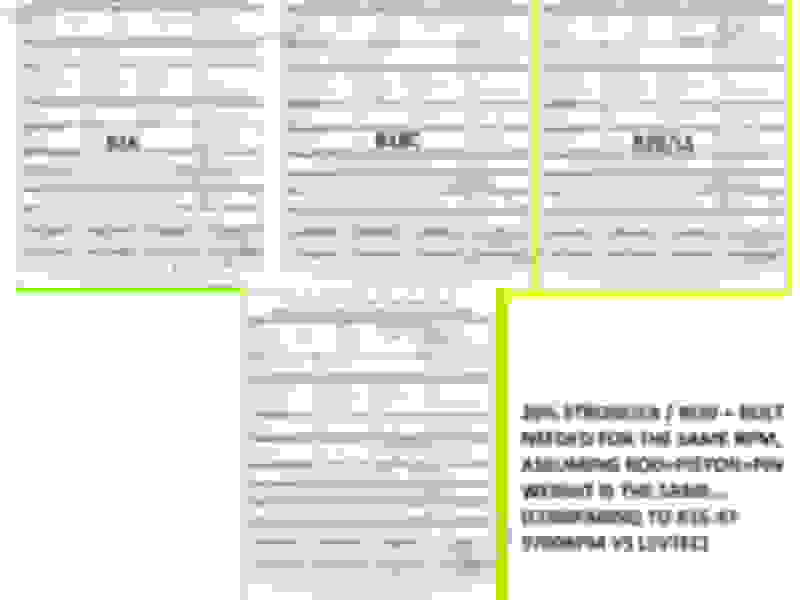 EDIT I added the calculation on different forces based on rod stroke ratio on zealautowerks. 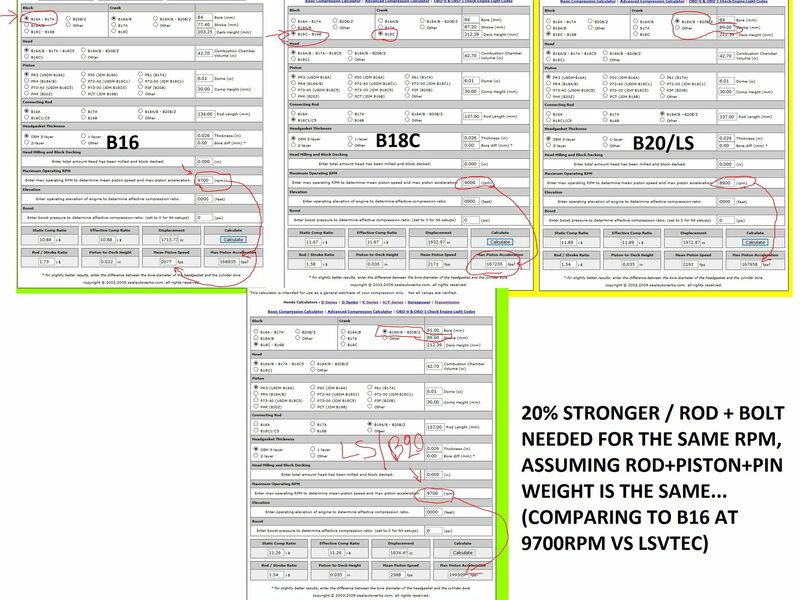 If you want 9700 on the LSVTEC you must have 20% strongest rod/bolt combo, if your piston/rod/bolt has the same weight. Last edited by Balor_Gr; 03-21-2018 at 11:51 AM. really do AT LEAST 9000rpms "just 'cuz". We're not all drag racing. So, you have to look at your utility and be objective and realistic. But if it's for your purpose, rock on! 10,000rpm! Last edited by TheShodan; 03-21-2018 at 01:39 PM. What im trying to say is rpm per rpm on the same combo weight you allways need 15-20% stronger rod/bolt not accounting the extra torque thats it. and no rod failure. That huge torque on the cheap h-beams/arp2000. Once they try the honda way of big turbo big peak number that requires high rpm for powerband you see failures start more and more. Even on the same torque. Thats why im theorising that rpm on our engines "hits" the bols harder than we hit the torque margin of the rod. I wont go crazy above 9000. Max like 9100-9200. 9000 Rpms is not that high honestly, I ran Manley Turbo Tuff rods for 5 years at 10,500 RPMS before a rod bearing failed during a pass and took the block out. Really, if you are worried about it just spend the money and buy the Turbo Tuff rods with the 625+ upgrade and you won't have to worry. Correct. I just wanted Balor_Gr to stipulate that being realistic about the rpm level that he's using didn't warrant the upgrade despite the great math and piston speeds he presented.. But peace of mind and personal choice are another matter, altogether. If he wants to feel better by putting +625 bolts in, great, by all means, do so with confidence. But do it for your own reasons, not go through all the muck of trying to get us to help convince yourself of your own decision that you have already made. It's ok, no one judges you here, you're in the right path regardless. Exactly, it's one of those cases where people already make the decision but want others to support what they are thinking LOL. I say for the couple hundred extra dollars if it makes you sleep better at night go for it. Yes no prob. life is good yeah.I hope i manage to finish the sol before they call me to fight Turkey haha. Erdogan is holding the WW3 button this time. I wouldn't play around with Brian Crower at all. If you want peace of mind, get the Turbo Tuff from the beginning... Not booty around with just the rod bolts. hahaha yeah i know i removed it from my mind by force. Eagle H-Beam Rods - Wiseco Pistons - ACL Bearings - Brian Crower - Unbeatable Prices!